To check out some more tasty slow cooker treats, head over to Sandra’s blog for Slow Cooking Thursday. Yummy! Combine all ingredients and shape into a loaf. Place in slow cooker. Cover and cook on low for 7-8 hours. Drain off fat as needed. If you would like to glaze your loaf: In a small bowl, whisk ⅓ cup GFCF ketchup, 2½ tablespoons brown sugar, 1 teaspoon GFCCF honey mustard and ½ teaspoon GFCF Worcestershire sauce. Spoon over the meatloaf. Cook 15 more minutes until sauce is heated through. 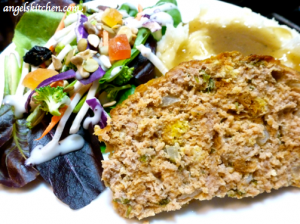 Let meatloaf “rest” 10-15 minutes out of the slow cooker before slicing. I happened upon your blog today and love it. However I have to ask you , since I am new here…your recipe calls for “GFCF”. What exactly is that? Is is a brand that you use? Thanks for the help. Ooops! I forget sometimes not everyone has to eat the same way as we do, sorry! GFCF means “Guten Free Casein Free”, or no gluten and dairy products for us! So, if I put down GFCF for bread crumbs, soy sauce or ketchup and your family doesn’t need it, just substitute your favorite kind. You can also use cow milk cup for cup to our GFCF milk substitute. The only place this doesn’t work is in my baking recipes where I need to use different flours (tapioca, bean, potato, etc.) and regular wheat flour would not work the same. Gluten free flours are so weird to work with sometimes!! I hope tht helps!